Subscribe to Searching for Spice! 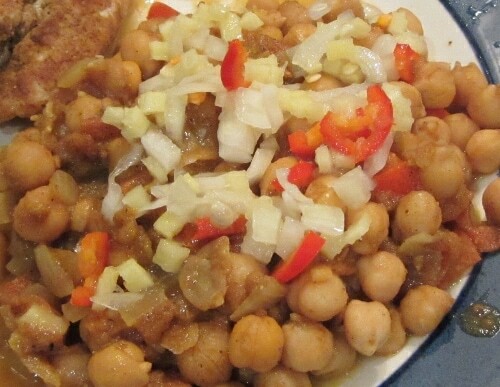 This sour chickpea dish, also known as khatte chhole, is a tasty recipe for spicy chickpeas in a curry sauce with a chilli, ginger, onion and lemon juice dressing. It’s so easy to adapt the heat levels in these spicy chickpeas! I’ve been rather excited recently to discover that both children will eat chickpeas. Well, in limited quantities anyway. As we all love curries these spicy chickpeas are a great choice for us when when we want a meatless dinner. Not only are the chickpeas in a delicious but mildly spiced curry, the spicy lemon and chilli dressing is poured on at the end to make the sour chickpeas. This means it’s a very easy meal if you need to adapt the level of spiciness for different members of the family. In our house that happens all the time! Our children love curries and will eat spicier foods than a lot of children, but they still need most curries to be toned down a little. This means I am quite used to eating milder curries but with a few tongue tingling pieces of raw fresh chilli pepper dotted throughout. With this recipe, all the strong flavours are in the dressing. You can add as much or as little of it as you like to each portion. You can then stir it in for an even flavour or leave it on the top so you get a big hit of sourness and heat in certain spoonfuls! Mr Searching for Spice and I both really liked the strong flavours of the dressing against the chickpeas. It was certainly the dressing that made the dish special. I first made this dish five years ago and it was the lemon dressing along with the name, ‘sour chickpeas’ that caught my eye when I saw it in Madhur Jaffrey’s Indian Cookery. As soon as I saw it I knew I wanted to try that dressing out. I love lemon in savoury recipes. I think it makes a brilliant base for a salad dressing or marinade. But until I came across this I had never made a dressing to pour on top of a curry. How do you serve these spicy chickpeas? I love to eat these spicy chickpeas with plain basmati rice but they would also go well with any type of Indian flatbread. If you have the time to prepare some more recipes then why not make a few different dishes? I’ve got lots more easy Indian recipes I could recommend such as dry curried okra or North Indian chicken curry or lamb meatball curry? This sour chickpea dish, also known as khatte chhole, is a tasty recipe for spicy chickpeas in a curry sauce with a chilli, ginger, onion and lemon juice dressing. If you want a vegan curry recipe with a zesty kick then this is definitely one to try! Make the sour dressing first. In a small bowl put half of the chilli pepper, the ginger and 1/4 of the onion. Pour the lemon juice over the top and add a pinch of salt. Leave until ready to serve. Cook the rest of the onion and chilli pepper in a saucepan until soft. Add the chopped tomatoes and cook for another couple of minutes. Then add the chickpeas, the spices and about 200ml of water. Bring up to the boil then lower the heat to a simmer about for 20 minutes. When ready to serve, either stir the dressing into the chickpeas or serve it on top of the chickpeas. Nutritional information is approximate and a guideline only. Pin these spicy chickpeas for later! How about trying one of these spicy vegan recipes next? I have lots of meaty and meat-free spicy recipes but here are just some that you might like! Let me know if you try any. Do let me know if you make these sour chickpeas or any of my other recipes. I love to get feedback from readers. You can also stay up to date by following on Instagram, Facebook and Twitter. Yes, I’m really pleased my children will eat curries but at the same time if I try to put any other veggies in then Little Miss Spice will avoid them! She also won’t eat rice with it! The recipe sounds great. My husband and I love chickpeas and we eat vegan most of the time, so this recipe is great for us. I should make this, as it sounds delicious. I’m so pleased you like it Anca – Let me know if you make it! I do love chickpeas! This looks yummy! Thanks Kat! It’s the type of meal that is very easy to throw together if it ends up being dinner time and we haven’t planned what to eat – there’s always chickpeas in the cupboard and most of the other ingredients too! Thanks Camilla! I hope she does like it – Let me know if you make it! Oh wow this is my perfect dish! I had a lemony chickpea dish in India that I’ve never forgotten but I haven’t quite managed to recreate it at home. Must try this. I hope this manages to come close! I loved the flavours of the dressing poured over the top – it really livened up the chickpeas. I haven’t made poories myself but one of my friends who is from India often makes them. This would go very well with poories and children love them! Another delicious looking spicy dish from you Corina, your blog always makes me rather hungry when i look at it. I cook dried chickpeas in the Instant pot and keep them in tubs in the freezer . I would really like to get an Instant Pot Jacqui! I almost got one for Christmas and when I did the Indian cookery course recently I realised how useful it would be to be able to cook dried beans from scratch. I might have to go ahead and get one soon! We love sour dishes and dressings! And I love all the ingredients in it here. Such a flavorful combination! I always have bags of boiled chickpeas in the freezer, so I must try it as a side dish for dinner tonight. Thanks for sharing the recipe here! Sometimes lemon just makes a dish perfect! I have never tried chickpeas this way. This is a very interesting recipe! I love the flavors in these chickpeas! What a great dish.